AMOS (Angular Merger of Signals) is an at-risk dashboard that can be customized to display any factors that are in PowerSchool. Each metric can be identified at the school or district level. Typical factors include current grades, cumulative grades, attendance, discipline, work completion, enrollment in activities, and test scores. The data grid can even display extended schema, such as community service hours worked or anything else that a school tracks within PowerSchool. At-risk data is extracted and cached inside of PowerSchool to provide instant access to nearly real-time information. 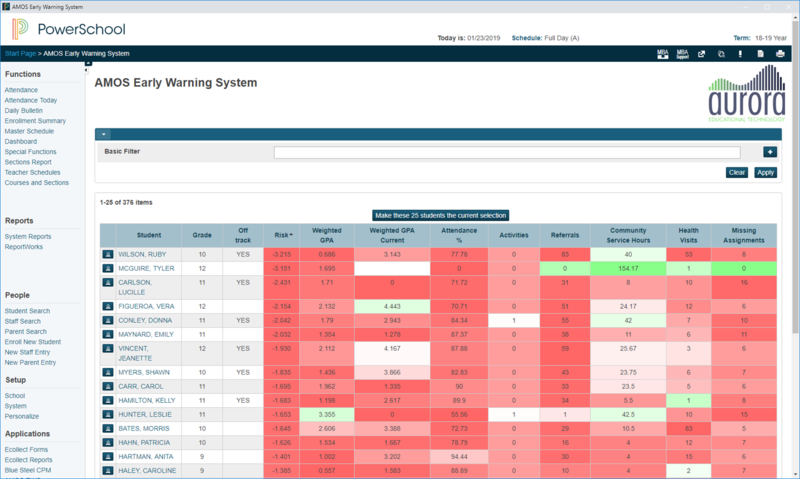 Admins and teachers can see a heatmapped data grid for all students in the school. Students are sorted by taking a weighted average of the factors that are on display. The relative weights for each metric are specified by the system administrator and can be empirically determined as part of implementation. Hovering over a cell provides a hint about the underlying information, while clicking a cell can take the user to a student page with granular detail about the student’s performance. The data grid allows for sorting and filtering on any of the factors. Once a group of students has been identified, they can be made the user’s current selection. Student names can be masked using a single button to facilitate a conversation with a student about his or her performance without exposing peer comparison data to the student. Multiple views can be configured at the school or district level. For example, a school can have a view for all students in addition to views separated by grade level. Views can also be configured based on student variables, such as only displaying students with 3 or more absences, 10 or more referrals, and 1 or more D/F grade. The AMOS Early Warning System is available for $1 per student per year, for only the students who are currently in use. This means implementations are customizable to specific buildings, grade levels, or district-wide.